Our cold pressed, filtered coconut oil is a favourite for cooking and adding to smoothies. Unlike other oils, it doesn’t create toxic trans-fats when heated. Plus, it’s a great source of energy and can help support a healthy weight. Flavour free, dairy free and cholesterol free, our organic coconut oil has been gently filtered to create the purest formula. 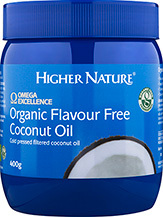 A great alternative to butter or olive oil, switch to coconut oil for a healthy way to fry, sauté and roast your meals. Why is it a superfood? Because it’s a safe oil to heat and use in baking. 6615mg Lauric acid, 2640mg Myristic acid, 1128mg Monounsaturates (Omega 9 FA), 302mg Polyunsaturates, 276mg Linoleic acid (Omega 6 EFA). Store in a cool, dark place. Refrigerate after opening and is best consumed within 3 months. I used Omega Excellence to cook my roast potatoes for the first time at the weekend. My children said they were the most delicious and crispy roast potatoes ever! 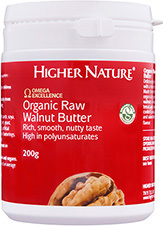 I will definately be using Omega Excellence Coconut Butter whenever I cook a roast now, safe in the knowledge that this is also a far healthier option. 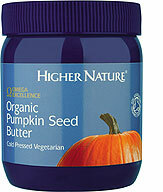 Organic Coconut Butter - FANTASTIC! I love this oil for cooking and also love to spread it on oatcakes. This is my preferred brand of coconut oil, being not especially keen on the coconut taste of the others - the flavour of the virgin oils is OK spread on bread or cooked vegetables, but as a cooking oil it imparts a strong coconut taste which doesn't always go well with what you're cooking. This one is the perfect solution - it's more or less taste-free, and unlike some cheaper refined coconut oils that I've tried, you can tell it's good quality (some taste a bit plastic-y). Definitely worth buying, and a great metabolism booster (unlike polyunsaturated fats such as sunflower/flax/nut oils, this WON'T cause weight gain or health issues. 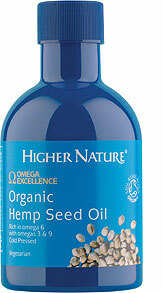 This oil is so versatile and has too many benefits to list in a review. Info readily available on the internet. Perfect oil for cooking, ingesting cold and for skin and hair care for those who don't want or like the coconut smell. Being deodorised makes it perfect for cooking when you don't want a coconut flavour and for 'oil pulling' if the taste and smell makes you gag. is Genius!